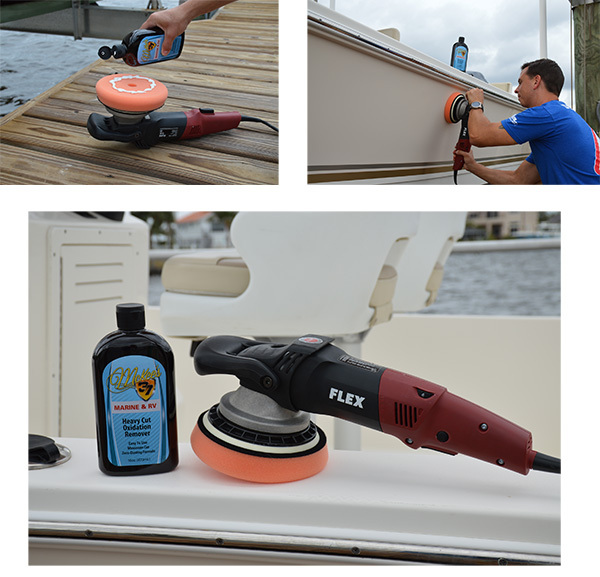 Keep your gelcoat free of that chalky oxidation with McKee's 37 Marine & RV Heavy Cut Oxidation Remover! 2. Apply an X of polish directly onto heavy cutting foam or wool pad. 3. Spread polish over a 2’ x 2’ area with the machine turned OFF. For a rotary polisher, set speed between 1200 and 1500 RPM. For a dual action polisher, set speed between 5000 and 6000 OPM. 4. Using a slow arm movement with heavy downward pressure, perform 4-5 section passes, or until the polish turns clear. 5. Buff to a high gloss using a clean, soft microfiber or terrycloth towel. 6. Follow with McKee’s 37 Gloss Enhancing Final Polish to further refine the surface. McKee's 37 Marine & RV Mildew RemoverMcKee’s 37 Marine & RV Mildew Protectant SprayMcKee’s 37 Marine & RV Water-Resistant Vinyl ProtectantMcKee’s 37 Marine & RV Gloss Enhancing Final PolishMcKee's 37 Marine & RV Hydro Pearl Sio2 CoatingMcKee's 37 Marine & RV Final Step Detail WaxMcKee's 37 Marine & RV All-In-One Fabric & Vinyl CleanerMcKee's 37 Marine & RV Carnauba Wash & WaxMcKee’s 37 Marine & RV Heavy Duty Cleaner WaxMcKee’s 37 Marine & RV Repel Glass & Plastic CleanerMcKee’s 37 Marine & RV All Purpose Surface CleanerMcKee’s 37 Marine & RV Bug Remover & Wax RestorerMcKee’s 37 Marine & RV Vinyl Decal & Graphic RestorerMcKee’s 37 Marine & RV Carnauba Sealant WaxMcKee’s 37 Marine & RV One-Step Polish & SealantMcKee’s 37 Marine & RV Repel Glass & Plastic Cleaner 128 oz.McKee's 37 Marine & RV Final Step Detail Wax 128 oz.McKee's 37 Marine & RV Carnauba Wash & Wax 128 oz.McKee's 37 Marine & RV All Purpose Surface CleanerMcKee’s 37 Marine & RV Bug Remover & Wax Restorer 128 oz.